With Mitsubishi Electric's single room air conditioning systems, you can enjoy your conservatory anytime of the day or season. Highly efficient and effective, the M-Series units effortlessly deliver instant cooling and heating - and operates from ONLY 8p per hour*! 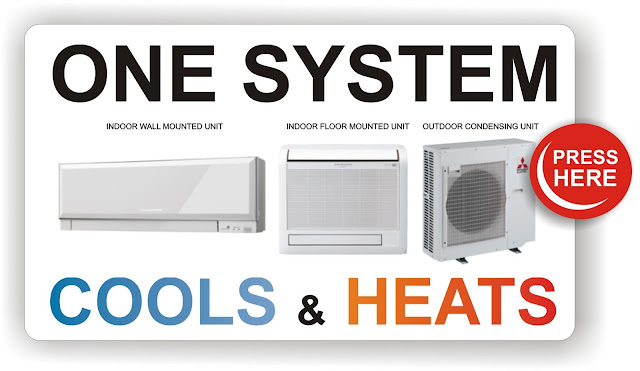 ONE SYSTEM - COOLS in summer and HEATS in Winter! No need to extend an existing heating system and dig up floors for radiators, as long as there is an external and internal wall, our single room 'conditioners' can be simply and quickly installed - with minimal disruption! What’s so good about Mitsubishi Electric's single room wall and floor mounted air conditioners? If you would like air cool engineering (NI) Ltd to provide you with a FREE no obligation site survey and quotation, please email here. Alternatively, to see our wall and floor conditioners in action, please do not hesitate in calling into our purpose built offices in Limavady. Please call +44 (0)28 777 67114 to arrange a visit. *3.5kW system running 6hrs/day, 100 days in cooling & 100 days in heating per year. Source: Mitsubishi Electric Seasonal Energy Consumption Calculator May 2015. Electricity based at 17p per kWh. Please note that a site survey is required to correctly 'size' an air conditioning unit.